Born in Co Derry, Jack Doherty studied at the Ulster College of Art and Design in Belfast wanting to be a painter, but after a visit to Lucie Rie's studio he decided he wanted to make pots for a living. On graduating he worked at Kilkenny Design Workshops before establishing his first studio in Co Armagh and then relocated to Herefordshire. 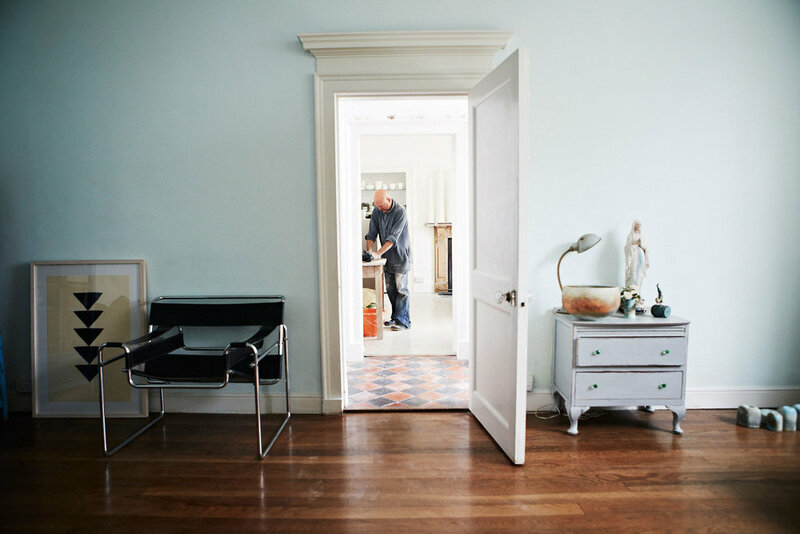 From 2008 - 2013 Jack was the first Lead Potter and Creative Director at the refurbished Leach Pottery in St Ives, Cornwall where he established the production studio and designed a contemporary domestic range of soda-fired tableware. Designing and making have shaped his life. As a potter and ceramic artist he has gained an international reputation exhibiting extensively in the UK and abroad. Jack works with one clay body, one mineral and one single firing technique. Through this singleness of process he is able to obtain a complex, multi-layering of surface texture and colour, whilst remaining true to the form. His ceramic vessels are represented in many public collections including the Irish Contemporary Ceramics Collection at the Hunt Museum, Limerick, the National Museum of Ireland and the Ulster Museum. In 2016 he received the Janet Mansfield Memorial Award in recognition of his work with soda-fired porcelain. He currently works independently from his home studio in Mousehole and is resident potter at the Newlyn School of Art where he fire his gas kiln. Jack's professional experience has led to his involvement in promoting and raising the profile of contemporary ceramics on many levels including lecturing, writing, curating exhibitions and organising conferences. He is a fellow and former Chair of the Craft Potters Association of Great Britain and was a founder member and Chair of the organising committee of Ceramic Art London for twelve years. He has been guest editor and a consultant to Ceramic Review magazine. His book, Porcelain, was published in 2002 by A&C Black. Most recently Jack has enjoyed travelling to Japan, China and Taiwan invited as artist in residence and to showcase his work at the Mashiko Museum of Ceramic Art and Fuping Pottery Village, Xian. He is honoured to be invited as the guest director for the first international soda-firing festival scheduled for September 2019.